The Konformist Blog: Opus Is Roadkill — McCain to Blame? Opus Is Roadkill — McCain to Blame? This penguin is about to be iced. Berkeley Breathed has announced he is killing off his Opus and retiring from comic-strip writing effective Nov. 2. 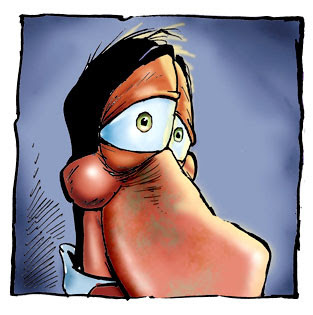 The 51-year-old Pulitzer Prize-winning Bloom County creator, who has spun off his beloved bird into cartoons and books, released the following statement: "30 years of cartooning to end. I'm destroying the village to save it. Opus would inevitably become a ranting mouthpiece in the coming wicked days, and I respect the other parts of him too much to see that happen. The Michael Moore part of me would kill the part of him that was important to his fans. "With the crisis in Wall Street and Washington, I'm suspending my comic strip to assist the nation. The best way I can help is to leave politics permanently and write funny stories for America's kids. I call on John McCain to join me." Rest in peace, little fellow. So When Will Banks Give Loans? A Little Austrian Town Named . . . . . .
How About A Bailout For America’s Family Farms? Did PBS bury controversial torture documentary? "Voting fraud itself is a fraud"
Does General Tso Actually Exist? WHAT'S THAT UP IN THE SKY?! Washington Bailout a Bust. Depression to Follow. Anne Hathaway books "Alice in Wonderland"